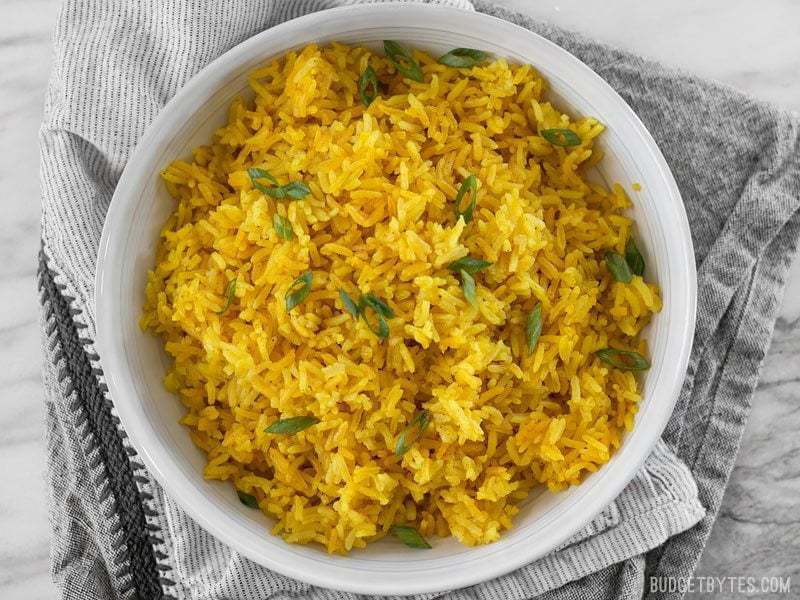 Okay, this is a pretty big statement to make, but… This Yellow Jasmine Rice is the best rice I’ve ever had. Yep. The flavor is simply out of this world. The aroma as it cooked almost gave me a high. Plain white rice is dead to me now. If you follow the blog you’re probably familiar with how much I love jasmine rice. I don’t know how I lived my whole life without knowing about it, but since discovering it a year or two ago, I just can’t stop. It’s incredible. If you haven’t tried jasmine rice yet, go find it NOW. Photos, prices, and recipe updated 10-16-16. Jasmine rice is naturally fragrant and has the most wonderfully rich, mellow, and almost nutty flavor. You can find it at most major supermarkets either in the international foods aisle or in the rice section, usually on the bottom shelf. Even Walmart is in the jasmine rice game and is selling Great Value brand jasmine rice. It can be pricy if you buy one of those small specialty brand containers but if you buy an Asian brand (usually in larger bags on the bottom shelf), it can be just as inexpensive as regular rice. Also check bulk bins. 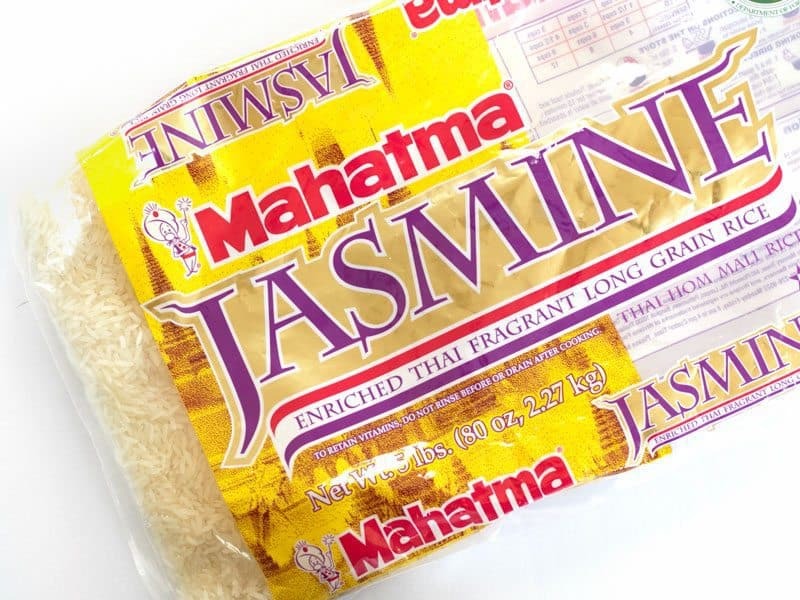 Some stores will have jasmine rice (white AND brown) in bulk. Anyway, I decided to kick up the jasmine rice by adding a few spices and something magical happened. 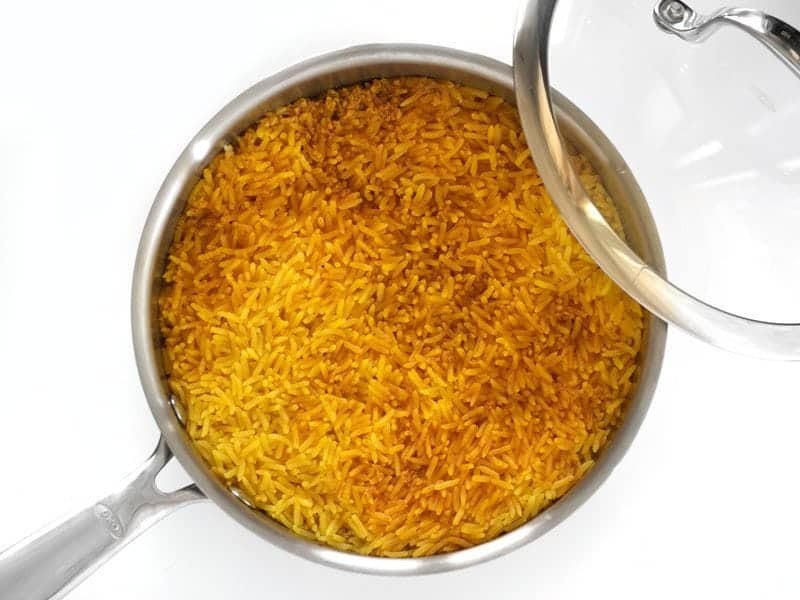 The turmeric and cumin added to the rich, nutty flavor of the jasmine rice and the little pinch of cinnamon added just a hint of spicy sweetness… like hitting the cymbals on a drum kit. The first bite was so good, I swear I saw angels. 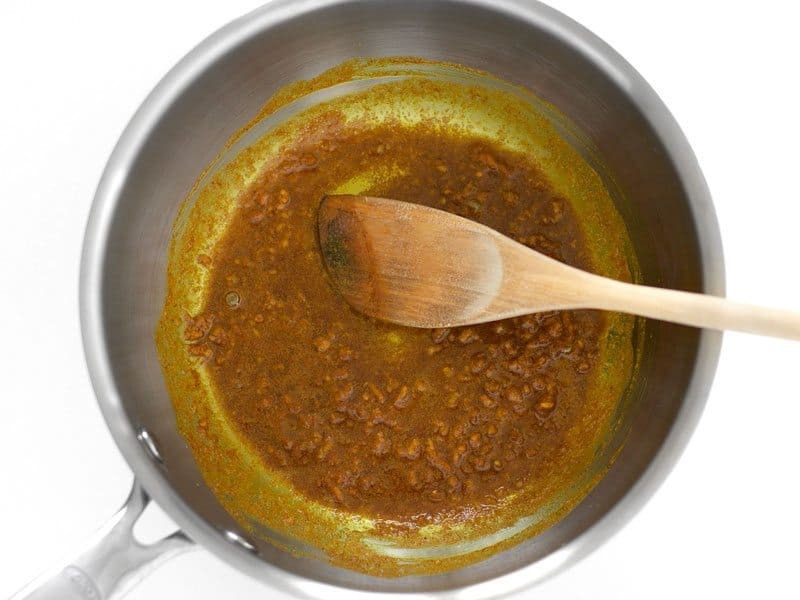 Add 2 Tbsp butter, 2 cloves minced garlic, 1 tsp turmeric, 1/4 tsp cumin, and 1/8 tsp cinnamon to a sauce pot. 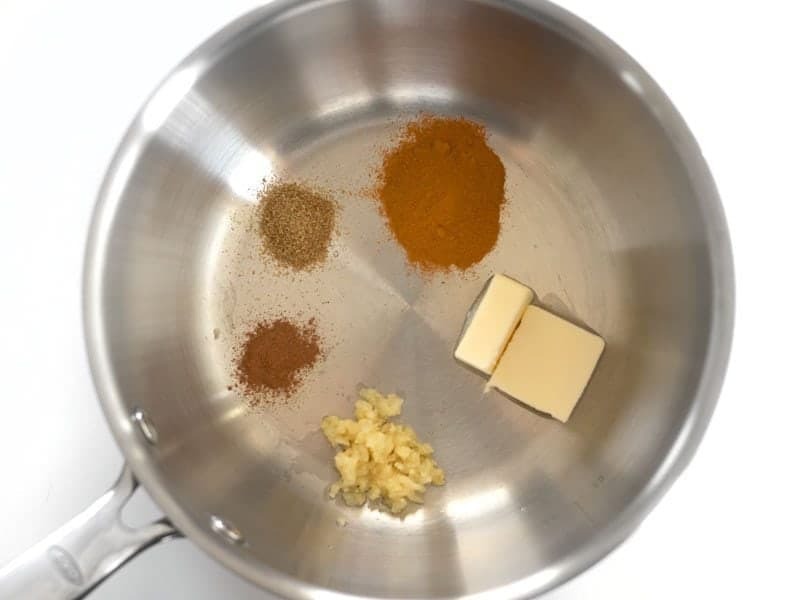 Sauté the garlic and spices in the butter over medium heat for 1-2 minutes, or just until the garlic has softened. Add 2 cups of uncooked long grain jasmine rice to the pot. I use this brand, which can be found in 5 lb. bags, usually on the bottom shelf of either the rice aisle, or the Asian section of major grocery stores. Stir and cook the rice in the butter and spices for about 2 minutes. This will toast the rice and spices giving them a deeper, nuttier flavor. You should hear a popping or crackling noise as the rice toasts. 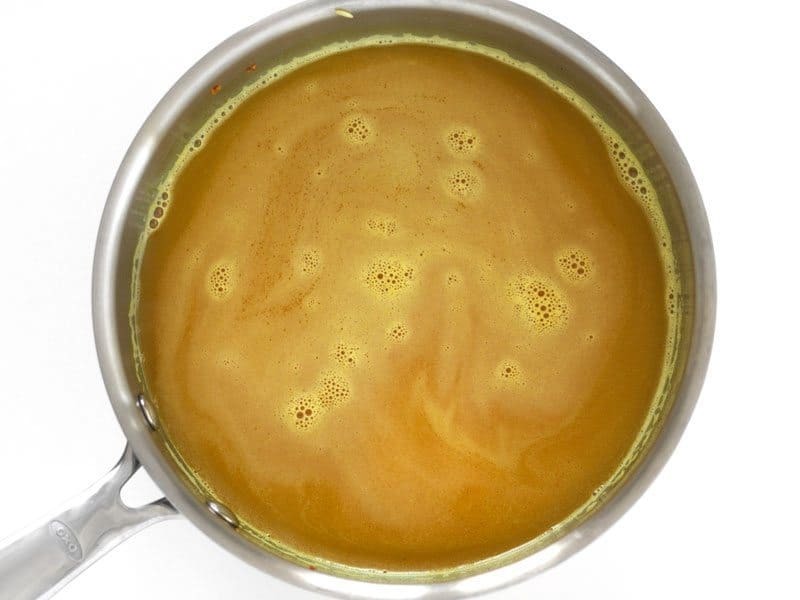 Add 3 cups of chicken broth to the pot, along with one bay leaf (if using). 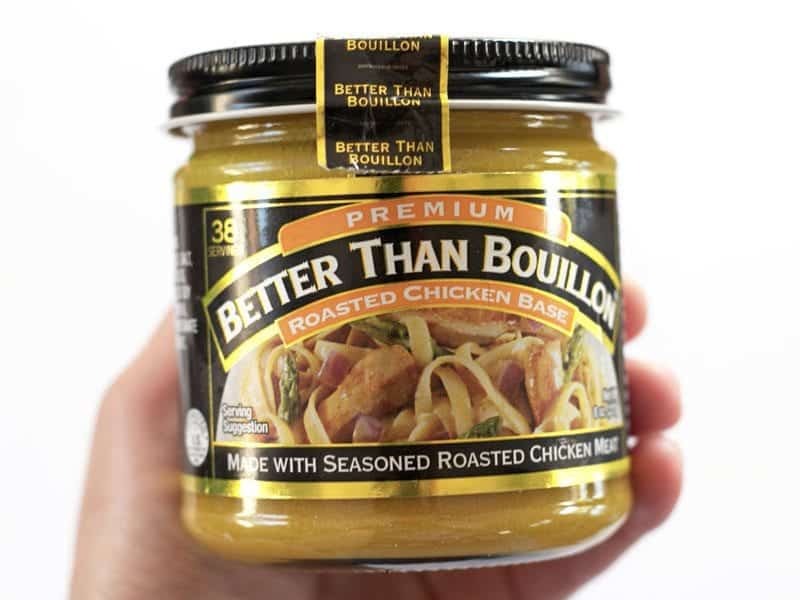 I use Better Than Bouillon to make my broth because it’s less expensive than buying cans/boxes of broth and way better quality than the little cubes. It also provides all the salt needed to season the rice. Give everything a good stir, place a lid on top, and increase the heat to high. Bring it up to a full boil then immediately turn the heat down to low. Let it simmer on low (with the lid) for 20 minutes. After 20 minutes, turn the heat off and let it sit undisturbed (do not remove the lid) for another 10 minutes. If you’re using a bay leaf, it will probably have floated up to the top and you can remove it at that point. You’ll also see swashes of spices over the surface. 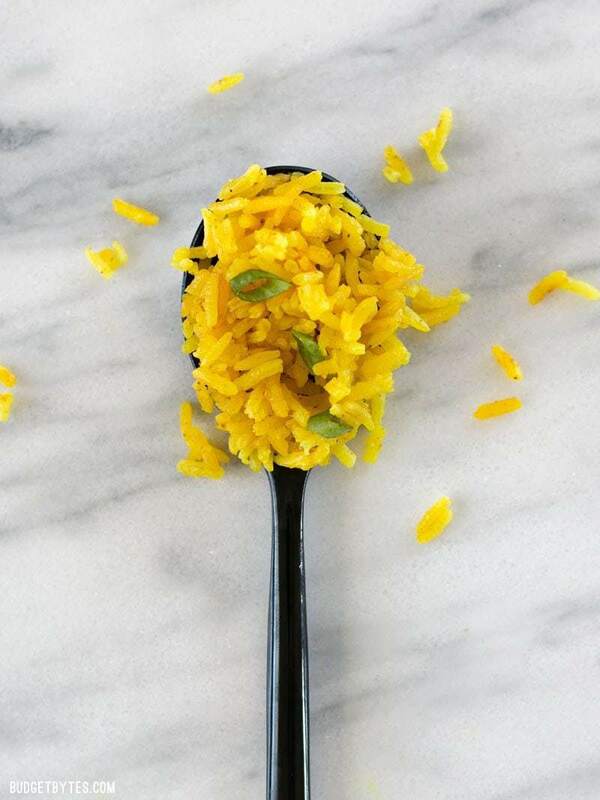 Fluff the Yellow Jasmine Rice with a fork to redistribute all the spices, then serve! Not kidding. Best rice I’ve EVER eaten. This came out delicious! Do you think this would work with cauliflower rice too? No, unfortunately that won’t work the same. 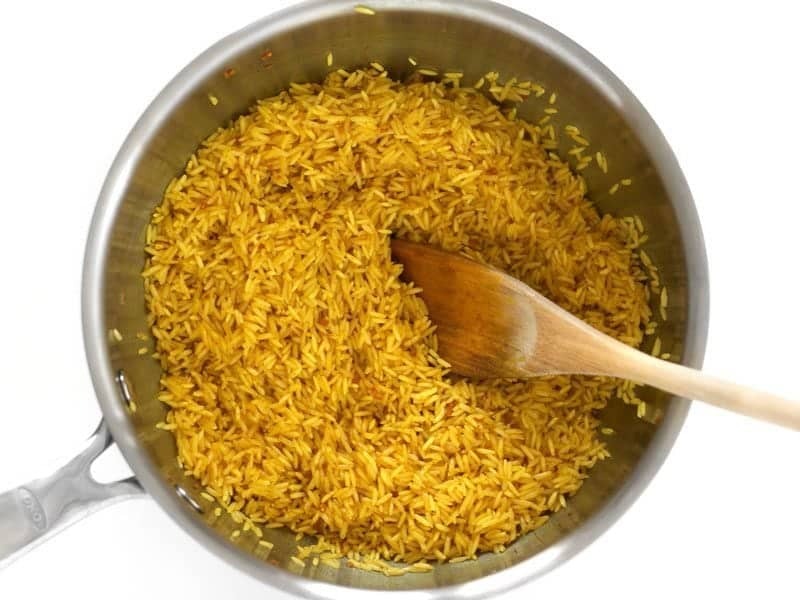 While you can add these spices to cauli rice, you can’t cook the cauli rice in chicken broth because cauli rice releases liquid, whereas regular rice absorbs it. So you’d be missing some important flavors there. So I guess what I mean is that you can do something similar, but it definitely won’t be the same. I agree. Best Rice Ever! 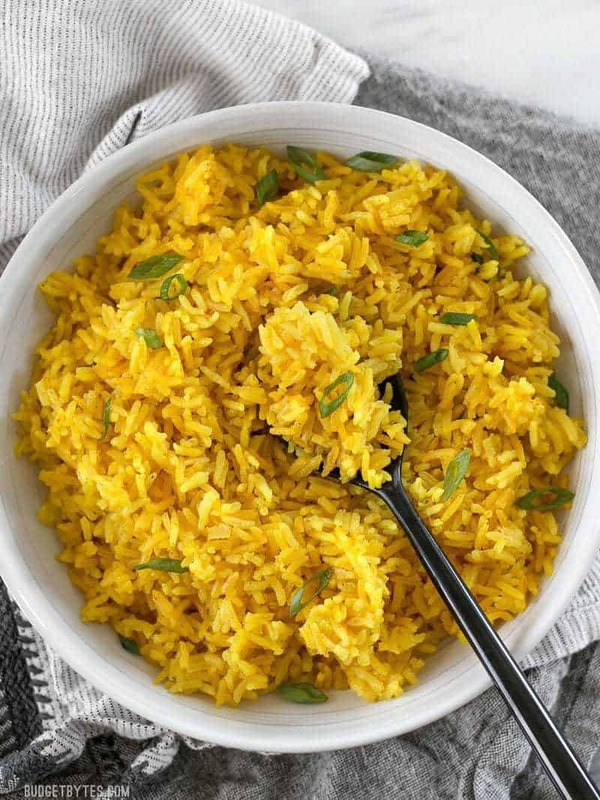 It’s easy to make, love that it has turmeric in it and is a definite step up from plain rice. It’s my go-to rice for salmon & chicken for sure. Would make a great skillet meal base. FANTASTIC. Made it to accompany leftover shawarma. Try it with toum! Just figured out a way to turn it into a meal by itself. After rice is completely done, add some chunks of zucchini, 1 egg per cup of cooked rice, then sprinkle some cheddar cheese and mix well. So good! It’s become a family favorite! Thank you! I made a super lazy version of this and it STILL turned out great, so I bet the original recipe is even better. I used garlic powder instead of fresh garlic and literally just threw all the ingredients into my rice cooker (didn’t toast in a pan or anything beforehand). SO F***ING amazing!!!! Although I do double the spices bc i like a little more flavor. Ive learned this is best, after making it several times thus far. And Better than Boullion is the WAY TO GO. no canned broth! This is an amazing recipe. Thank you!! Also, if any of you know the chamorro recipe for fina’deni sauce (soy sauce, vinegar, lemon, garlic, onions, tomatoes and hot chilis), it is a absolutley delicious combination. Keeping this recipe as a for sure GO-TO! Made this in my IP tonight. Fantastic side dish. Did you make it pot in pot?I would like to make it together with the 5 spice chicken if possible. Not too shabby. Yet, the cinnamon and cumin are overpowering. Relax on those two with a tad more butter and this dish is melt in your mouth! Very tasty but if you use broth rather than bullion be sure to add salt. This recipe looks amazing, and I’ll be making it ASAP. What would y’all suggest as the perfect main or other sides to serve along with? I like it with pretty much any roasted meat, or sometimes even with eggs. 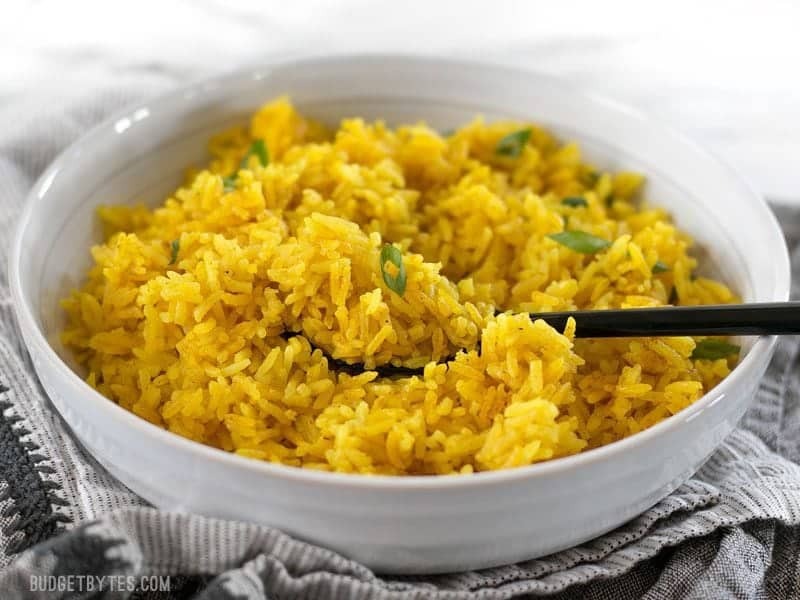 Here are a few recipes where I’ve used it before: Yellow Rice Chicken Skillet, Golden Rice Bowls, Slow Cooker 5 Spice Chicken, Adobo Chicken Meal Prep. Can I use a rice cooker for this recipe after I cook the ingredients in the pan first? 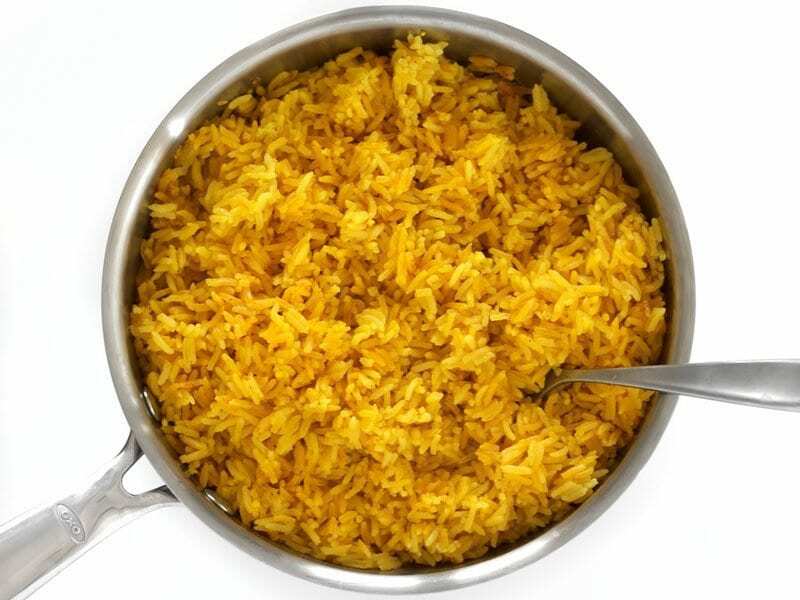 This is my go to yellow rice. I’ve used water with salt when I’m out of chicken broth. Still good! Sometimes I add chopped cilantro after it’s done. Why can’t I find this recipe on the app? I’ve tried searching for it there, but can only find it referenced in the golden rice bowls and associated main dishes. It’s my favorite Budget Bytes recipe, and I’d really like to be able to access it through the app. Made it today. Taste nice .Will be make it agine.